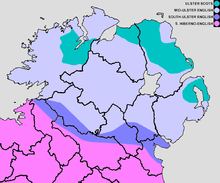 Ulster Scots, sometimes called Ullans, is a dialect of Lowland Scots that is spoken in some of the northern parts of Ireland, across Ulster. It is closely related to the English language. The cross-border Boord o Ulstèr-Scotch, established as a result of the Good Friday Agreement, promotes usage. Approximate boundaries of the traditional Scots language areas in Ulster, shaded in turquoise. Based on The Scotch-Irish Dialect Boundaries in Ulster (1972) by R. J. Gregg. ↑ "Ulster-Scots - the Language of the Laggan". Askaboutireland.ie. Retrieved 17 April 2015. ↑ Hammarström, Harald; Forkel, Robert; Haspelmath, Martin, eds. (2017). "Ulster [Scots]". Glottolog 3.0. Jena, Germany: Max Planck Institute for the Science of Human History.